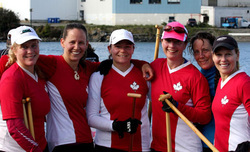 Our club is competitively-focused but welcoming of all paddlers. We have men's, women's and mixed teams practicing several times per week, as well as a recreational group for those who want to paddle for fitness and fun. Our compound is conveniently located at the Courtenay Airpark Marina boat launch and has four OC6 (6 person) canoes and several OC2's and OC1's (one and two person canoes) for club member use. You will be responsible to provide your own paddle and personal safety gear. If you would like to give it a try, contact us to arrange joining one of our sessions. Though we paddle year round ( including the occasional crisp day in December & January), the outrigger competition season runs steady from February through October. Fill out the form and sign the waiver. Note: if you are under 19 years of age the signature of a parent or legal guardian is needed. Membership is $250 per year or $90 per quarter (plus a $25 Cora/Insurance fee). Families are $350 per year. Use of the OC6, OC2 or OC1 during regular scheduled practices, unless special arrangements have been made, is included.